Our dedicated site team have been busy assisting with the logistics of getting equipment to the fire crews. As you can imagine, the moorland terrain and habitat here, coupled with the wind and the unusually prolonged dry spell we have had over the past few months, make this a challenging situation. Along with multiple partners from throughout the Peak District National Park, we have also been helping to fight fires on the ground. It is not yet possible for us to fully know the extent of the damage from the wildfire here at Dove Stone, until we can properly assess the site. Whilst the fire likely started some distance from Dove Stone, the unusually dry conditions we have had over the past few months, mean it spread quickly and over a large area, and it has reached land managed by the RSPB. We are concerned about damage to the blanket bog that we have been restoring in partnership with land owners United Utilities, which looks to be severely damaged, but the size of this area is not something we know at this stage. Many of you will be familiar with some of our recent restoration work thanks to a feature on the latest series of BBC Autumnwatch. Thankfully the fire has not hit this bog area with the most breeding wading birds such as dunlin, curlew and golden plover, but the area hit will undoubtedly have affected a variety of wildlife that lives on the moor such as red grouse, mountain hares, voles, insects and nesting birds like skylarks and meadow pipits. 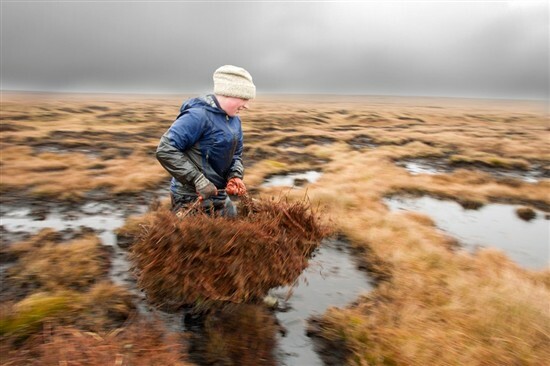 Visually, the moorland here can look quite bleak and barren (especially on wet, windy, winter days), but blanket bog, one of the key habitats we have here, is internationally important, with the UK having 10-15% of the world’s total. It plays a vital role not only for wildlife, but in storing carbon and improving water quality. Healthy bogs can tackle climate change by locking up harmful carbon in the peat and preventing its release into the atmosphere. More carbon is stored in this country’s blanket bog than in all of the UK’s, French and German forests put together! Healthy blanket bog is also incredibly important for water quality. It acts as a natural filtration system into our reservoirs. The cleaner the quality of the water coming off the moor, the cheaper it is to treat and so saves money for customers. Improving the habitat here improves the water quality too. We work closely with north west water company - United Utilities who own the land at Dove Stone, who report that their cleanest water comes from peat bog that is wet and sphagnum rich. The upland areas of the Peak District used to boast thriving blanket bogs but a combination of industrial pollution, moorland fires and heavy grazing, left them seriously damaged with large areas of exposed bare peat and a limited amount of vegetation. Since 2010, the RSPB and United Utilities have been restoring blanket bog at Dove Stone in partnership with tenant farmers. This has involved establishing vegetation on large areas of bare peat, placing dams in eroded gullies to slow water flow and planting sphagnum moss in recovering areas to kick-start the process of bog recovery. Essentially the idea is to make these dry uplands wetter! Sphagnum moss is an incredible species that acts like a sponge and can hold up to 10 times its own weight in water. It is this ability to hold water that is the key to a healthy bog. As well as slowing down the flow of water into the reservoirs and therefore improving the quality of the water (as it contains less soil), wet bog is known to have higher numbers of key insects like crane flies (daddy long-legs) that are a key food for many of the special birds that breed on the moor. This restoration work has already helped threatened moorland birds with Dove Stone recording a rise in dunlins, golden plovers, curlews and red grouse. Thank to all those who have offered to help wildlife during this challenging time with the fire. All you can do is stay safe and please follow the advice given by all the agencies involved - do not be tempted to come up to the fire site to try to view this scene and please do not leave your vehicles on any lanes that give access to the moorland locations here, as the emergency services need clear access. This is still an active and changeable situation and it is not clear how long it may take to put out, so we will continue to be out on site assisting the dedicated fire crews and working with all our partners who have worked tirelessly in fighting this fire. We would like to say enormous thanks to them all, and the volunteers who have been providing food and drinks to the agencies involved. Keep your eyes open for any signs of fire and report anything you see to the fire service. The quicker they are able to respond, the less damage occurs. Please do not have BBQs at Dove Stone. Whilst it is a beautiful place that people understandably like to come and socialise with friends and family, BBQs are not permitted here due to their fire risk. Please take your litter home with you. Glass in particular can cause fires to start in hot weather. Please do not discard cigarette butts on the ground – even the smallest spark can create a large fire, particularly in these dry conditions. We will update again when we know more about how big an area has been affected as well as the habitat and wildlife implications.